When someone decides to read the Bible, for whatever reason, they will normally start at Genesis and work quickly through that and the first half of Exodus. Then, about chapter 25 of Exodus, the reading slows down. Eventually, it is treated as a chore rather than a pleasure. For many, this is the standard pattern. By the time they get to Leviticus, the book is closed, placed on a shelf, and never referred to again, except in times of great distress or personal need. In distress, the psalms are referred to. Maybe even the beatitudes are checked out. For times of personal need, it is common to open the Bible arbitrarily with eyes closed, and then to point to any given portion with the right (yes, it must be the right) index finger. And then,,, in hopes of something miraculous directing their way to riches and glory, or the repair of a failed marriage, or whatever, they open their eyes and feast on that one verse. If it is a verse or passage which gives them hope, the book is closed with satisfied delight. “Yay! I will have the years that the locust ate away at my possessions restored to me!” If the verse isn’t a satisfying one, the process is repeated until something better is obtained. And then all is right with the world once again. The book is closed and peace is restored. It is certain that nobody wants that one passage to be 2 Chronicles 21:12-15. That’s for sure. This is the effect that the book of Leviticus has on many people. It is viewed as strange, hard to comprehend, brutal or outdated, and completely irrelevant to the world we live in today. It is, to them, as painful as having their blindly placed finger wind up on those words of 2 Chronicles. Words which, by the way, are our text verse of the day. Because you have not walked in the ways of Jehoshaphat your father, or in the ways of Asa king of Judah, 13 but have walked in the way of the kings of Israel, and have made Judah and the inhabitants of Jerusalem to play the harlot like the harlotry of the house of Ahab, and also have killed your brothers, those of your father’s household, who were better than yourself, 14 behold, the Lord will strike your people with a serious affliction—your children, your wives, and all your possessions; 15 and you will become very sick with a disease of your intestines, until your intestines come out by reason of the sickness, day by day.” 2 Chronicles 21:12-15. Reading the book of Leviticus seems as painful to many as the fate of Jehoram, king of Judah. Be honest, how many of you have ever read the entire book of Leviticus? And of you who have, do you delight in it each time you come to it? Do you say, “Oh boy! This is the cat’s meow and the bees knees?” Or do you read it to get through it and onto the next book? While in Bible college, there was very little Bible involved. We had a few courses, but most of it was religious stuff, not Bible stuff. But there were a few mandatory Bible courses. One of them was “Old Testament Survey.” It was a survey of the entire Old Testament in a one week module. If one expected great theological discoveries from the Old Testament, this was not going to happen. However, the professor asked that during the course each student would pick one Old Testament book, and do a full summary on it. We were to outline it, explain its authorship and dating, give its historical context, provide a summary of the book, and include the messianic expectations which could be derived from it. Further, we were to include an application of that particular book to our lives. As the choice of book was up to each of us, it was obvious that a very large and complicated book, like Ruth or Jonah would be chosen. For the truly daring, the one-chapter book of Obadiah might be the courageous choice. As this is what was normally expected, my professor nearly had a heart attack when I told him I wanted to do Leviticus. Surely, of all of the books of the Old Testament, this one had the least to offer, especially concerning messianic expectations and contemporary applications! But he was more than excited to approve my choice and await my submission. I chose Leviticus, because it is the heart of the Law of Moses, and one cannot understand the greater work of Christ properly without understanding that work in relation to the law. Further, messianic expectations in Leviticus literally permeate the book. Like the detailed and marvelously pictorial hints of Christ in the construction of the sanctuary, each portion of Leviticus follows along that path as well. For those of you who survive through this book, you will have a much fuller understanding of the work of Christ, and how Leviticus points to our desperate need for Him. I will not lie that there are portions which will seem tedious and repetitive to you. However, we will get through them, and you will ultimately say, “I will never look at this marvelous book the same again.” LEVITICUS! It is a marvel and a treasure of God’s wisdom and glory – revealed in Jesus Christ our Lord. Yes, it is a glorious part of His superior word. And so let’s turn to that precious word once again and… May God speak to us through His word today and may His glorious name ever be praised. The book of Leviticus is the third book of the Law of Moses and of the Holy Bible. Its Hebrew name is derived from the first word of the book, va’yikra, which literally means “and called.” In Hebrew, the word consists of the letters vav, yod, qoph, resh, and aleph which numerically equal 317. This is numerically the same as the Hebrew word yabashah, or dry ground. We can think of Leviticus as the dry ground and firm footing of the Law of Moses. It is where the waters of chaos are separated and something substantial is brought out for the people of Israel to conduct their daily lives. Beginning the book with the word “And” signifies that this is a continuation of what has already been presented. The book of Exodus closed out, but it did not really end. 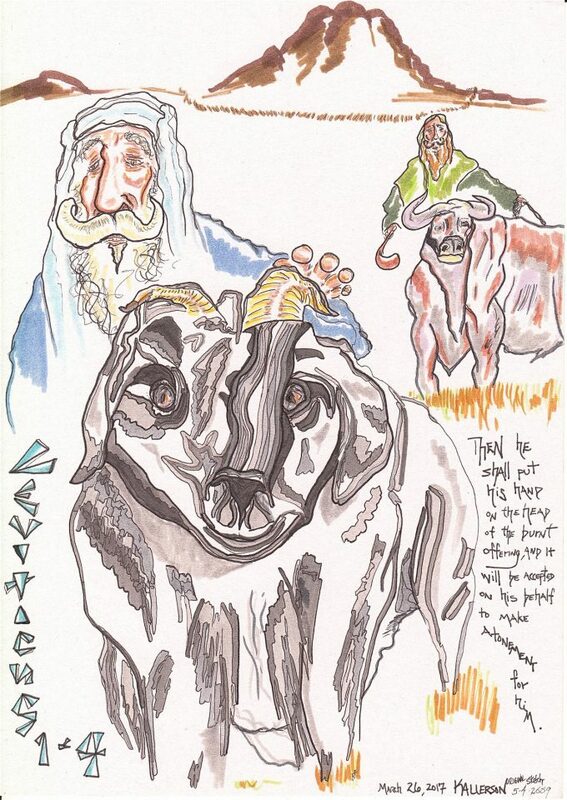 The thought process is simply continued with the opening of the book of Leviticus. In the Masoretic text of the Hebrew, in the last letter of the word va’yikra, the letter aleph is written smaller than the rest of the letters. This is known as a miniscule, and it is a rare occurrence in the Old Testament. Majuscule and miniscule letters show up in seemingly arbitrary places and without any explanation. For this reason, they can only be guessed at concerning what they mean. The scholar Rosenmüller notes that ancient variations of the manuscripts leave off the aleph at the end, and so it would say, “And the Lord appeared to Moses” instead of “And the Lord called out to Moses.” The smaller aleph might then be inserted to indicate that it is one or the other, but nobody is sure. Leviticus is the shortest book in the Pentateuch, being comprised of only 27 chapters, and yet it is certainly the most overlooked of these five masterpieces. A careful study of the book will lead the reader directly to Jesus Christ again and again – and again. As far as the book’s authorship and dating, the author is undoubtedly Moses. Despite modern higher criticism, there is no evidence to support anything other than Mosaic authorship. Internally, the book states, “And the Lord called out to Moses,” “The Lord spoke to Moses,” or “The Lord said to Moses,” etc., many times. In those words, Jesus cites a requirement specifically mentioned in Leviticus 14. Such New Testament references confirm, without any doubt at all, that Moses is the author of the book. There is dispute as to when this, along with the other 4 books of the law, was written; however, the conservative and traditional dating can be figured based on when Solomon’s Temple was built. By tracing back from that day as stated in 1 Kings 6:1, which indicates 480 years from the Exodus, we can assert with relative confidence that it was penned approximately 1445 BC. As Leviticus was certainly recorded by Moses during this 50-day period, we can be confident of this time-frame and dating. Whereas the book of Genesis spanned well over 2000 years of human history, Exodus spanned less than 100, and now Leviticus spans less than two full months. Although mere speculation, it very well may even be that the entire book was compiled during the eight days of the ordination of Aaron and his sons. The importance of the information then is seen in the condensed time-frame. Special attention was directed to the details of this book, ensuring that the precise instructions at a particular moment in redemptive history were carefully compiled for us. As far as a historical and redemptive context, the book was given to describe the proper method of approaching God; proper sacrifices when doing so; the priestly requirements which were intricately bound to the religious worship; and other areas of holy living. These were needed because of 1) The fallen condition of man; 2) The growth of the population of the chosen race to a point where organized worship became essential; and 3) The pagan conditions to which Israel had been exposed during their sojourn in Egypt, thus necessitating a complete break from the incorrect worship conditions which had surely been infused into the Hebrew society. The book deals with a multitude of matters which are all intricately connected to the coming Messiah, Jesus Christ. Although He fulfilled every stated requirement and Christological pre-figuring of Leviticus, thus redeeming us from the curse of the Law (see Galatians 3:10-13), we are reminded that we are to live holy lives before God. We can look back on the great prophetic fulfillments of Leviticus and have absolute surety that Jesus Christ was and is the Messiah, and therefore is God come in human flesh. Reading and understanding Leviticus also reminds us of the sincerity of God’s promises and curses. By following them, as laid out in Chapter 26, and then observing the consequences of them as fulfilled in the Jewish people, our faith is actually strengthened that all other promises in Scripture are also accurate and dependable. This book provides us with fundamental proofs of the surety of God’s Old Testament and its fulfillment in Jesus Christ as indicated in the New Testament. Concerning the sacrifices which are many, and which seem brutal to the world in which we live today, the entire sacrificial system was necessary until the time that the true Lamb of God, Jesus Christ, would come and fulfill each and every one of them. What the world sees as brutal concerning mere animal sacrifices is really a foreshadowing of the most brutal of all sacrifices. One which every person on earth contributed to in their sins of the flesh. In accomplishing this, several severe object lessons, involving the death of members of the congregation, will be included for the people to read and remember. As with many books of the Bible, there are countless sections and patterns which run through Leviticus, but as an overall theme, there are two major sections to the book. The first runs from chapter 1 to chapter 16. These are essentially laws for sacrifice and for purification. These will be highlighted by the laws for the Day of Atonement in Chapter 16. It is a chapter which so precisely pictures the coming Christ, that the only thing more exciting than reaching that chapter would be the rapture itself. The second major section will go from chapter 17 to chapter 27. These mostly look to the process of sanctification in the lives of the people. These will be highlighted in the instructions for the sabbatical years and the year of jubilee. The two series then remarkably correspond to one another. The first book of Moses looked to the work of God the Father through Christ in creation, and in directing that creation in the initial process of redemption. The second book of Moses then looked to the work of God the Son in Christ in the actual redemptive process, mirroring His own work countless times. This, the third book of Moses, will highlight then the work of the Holy Spirit applying the purification and sanctification of Christ to the people of God. In all three books though, it is Christ, the anticipated Son of God who is on prominent display. Nothing is more obvious, and in a thousand different ways it will become evident. When the book of Leviticus is over, the Person and work of Jesus Christ will have been highlighted so many times that you will never look at this book in the same way again. The beginning of Leviticus is being tied directly to this thought. As I said before, despite this being a new book, it is still only a continuation of the narrative which closed Exodus. Understanding that, we see that there is a time when the glory of the Lord retreated into the Most Holy place, and Moses was then able to enter there in order to speak with the Lord at the ark itself. This marks one of three most important points in the Lord’s dealings where Moses was specifically called by Him. He was called to his commission in Exodus 3:4 at the burning bush. He was then called twice in Exodus 19 from the top of Sinai prior to the giving of the Ten Commandments. And, he is now called at the beginning of the instructions for the divine worship. The instructions given to Moses here are to be relayed directly to the people of Israel, and not merely to the priests who will receive the offerings which will be laid out next. This then is a corporate instruction intended for all of the covenant people. This is similar to the call to the people to bring offerings for the construction of the sanctuary which was in Exodus 25:2. The call went out to the entire congregation for free-will offerings to be made. Something similar now occurs at the beginning of Leviticus, not for the construction, but for the use of, the sanctuary. There are many types of offerings which will be allowed – both in type and in purpose, and of which will be precisely named. Nothing else was to be offered except what the Lord specifically authorizes. Each will be detailed in a precise order as the book continues. The Hebrew reads, “When a man brings an offering.” However, the masculine speaks of both male and female, just as it traditionally has in English. This is confirmed, for example, in the Nazirite vow of Numbers 6 where both men and women could make such a vow. After the fulfillment of it, the offering was then presented by either the man or the woman. Further, the “when” of this verse implies “if.” Any person in the congregation could bring a voluntary offering. Though they are mandatory in the sense that they had to be brought in order to come near to the Lord, they are voluntary in that they accompanied the desire of the person to, in fact, come near to the Lord. The idea is that in order to approach near to the Lord, there must be an offering presented at that time. No person could draw near to a king or a royal without presenting an offering. How much more the Lord who was Israel’s true King. Jeremiah states that One would come who would be allowed to draw near to the Lord God. In the next chapter, it is revealed how this will be accomplished, which is through a New Covenant. When Jesus came, He established that New Covenant in His blood as is recorded in all three synoptic gospels, and which is confirmed by Paul in his writings, such as in 1 Corinthians 11 when speaking of the Lord’s Supper. This is followed up and explained in detail in the book of Hebrews. The instructions, going directly to the people instead of the priests, shows that the priest had no say in the offering, but rather he was to follow through with his part in the process, inspecting the offering for type, perfection, and conducting the associated work in transmitting the offering to the Lord. As long as we continue to think about how each detail points to Christ, the book of Leviticus will flow properly, it will be interesting, and it will reaffirm our own Christian walk which is far superior to these rites and rituals which are only foreshadowings of His great work. 2 (con’t) you shall bring your offering of the livestock—of the herd and of the flock. The first type of acceptable offerings are those of quadrupeds, or behemah. These are set off in contradistinction to the birds which will be mentioned starting in verse 14. The word behemah, or livestock, is then further defined by the terms ha’baqar and ha’tson, or the herd and the flock. The herd speaks of cattle, and the flock speaks of sheep or goats. The difference is found in the meaning of the words of each. The baqar, or cattle, indicates to seek or inquire. When one plows, they open up the ground, seeking out where to sow. The tson, or flock, comes from an unused root which speaks of migrating, just as flocks are known to do. Of the quadrupeds, only these were considered acceptable as offerings to the Lord. “Then Noah built an altar to the Lord, and took of every clean animal and of every clean bird, and offered burnt offerings on the altar. 21 And the Lord smelled a soothing aroma. Then the Lord said in His heart, ‘I will never again curse the ground for man’s sake, although the imagination of man’s heart is evil from his youth; nor will I again destroy every living thing as I have done. The last time this is mentioned in the Bible is actually in the New Testament. There in the Greek it is known as holokautoma. As you can hear, the word finds its origin in the Hebrew olah. However, if you listen carefully, you can also here where our word holocaust comes from. Thus, one can see the where the concept of our modern term is derived. Unlike the sin offerings and the peace offerings, the burnt offering was always to be a male. This was specified to more accurately picture Christ in this type of offering. This was an exception based on the circumstance, but not an acceptable custom according to the letter of the law. The words here are not well translated. It should not say, “of his own free will.” Rather, it should say, “that it may be accepted.” The word is ratson, and it can be translated either way, but many other passages in Exodus and Leviticus explain the meaning which is to be used. Despite this, and although it is not a sin offering, it certainly implies that there is a fracture between God and man which necessitated coming to the Lord with a gift in order to be accepted. But unlike the sin-offering, it is not intended to specifically take away sins so much as it is to obtain God’s favor. In other words, it looks to the universal sinfulness of man, whereas the sin-offering will look at the specific sins of man. In giving over this offering, it was picturing the surrendering of the life of the offeror wholly and completely to God, body and soul. 3 (con’t) at the door of the tabernacle of meeting before the Lord. These words needs to be considered properly. First, there was probably somebody outside of the sanctuary itself who inspected all animals, even before they were brought in. However, the offering itself, once accepted, would then be offered, as it says, “at the door of the tent of meeting. At that time, I noted that the altar was said to be “before the door of the tent of meeting” despite it having the laver between it and the actual tent. This placement of the altar of burnt offering answered to the placement of the altar of incense and the ark. Just as those were connected, so were the brazen altar and the door. We then learned that this pictured the work of Christ where He said that He is the good Shepherd. The altar was where the animals were offered, picturing Christ our offering. With that offering, He becomes our Door by which we again have access to the Father. Therefore, presenting the offering at the door of the tent of meeting actually indicates it being offered at the altar which then allows symbolic access through the door. The connection between the two is inseparable. The meaning of placing of the hands on the head of the animal is debated hotly, but the next clause explains why it is done. There is no need to go further, except to explain what the words in the clause signify. There is a perfect animal, one without reason – implying innocence, and it has been brought as a whole burnt offering to the Lord. The people who bring it, do so for a reason. One does not mow a patch of sand, and one does not water plastic plants. The burnt offering is intended to appease the Lord. If the Lord needs to be appeased, it indicates that there is an offender who seeks that appeasement. The person who places his hands on the animal then is acknowledging that this is HIS sacrifice. He is the offender, and it is his offering. He is asking that the offended will accept it in his place. The implication is that if it were not accepted, then his life is lost already, and would remain lost. Further, it is implied that this sacrifice would be sufficient to accomplish the mission. However, as these sacrifices were made often, it could only mean that they merely pictured a more perfect offering which lay ahead of them. Thus it was an anticipatory offering until a final, perfect offering could be made. *4 (fin) and it will be accepted on his behalf to make atonement for him. The same word, ratsah, is used again here which was incorrectly translated as free-will offering in verse 3. The clause says, v’nirtsah lo l’kapher alav – “…and will be accepted to him to make atonement for him. The act of placing the hands on the head of the animal is what makes the transfer acceptable, and it is what then makes kaphar, or atonement, for the individual. This word, kaphar, comes from a root which means to cover. When Noah covered the ark with bitumen, the word was used. Thus, it figuratively means to cover over or expiate sin. In providing atonement, the Lord is granting mercy, and thus reconciliation is realized. Although we are in the middle of a paragraph, this must be where we stop today, and so we will have to continue on with the rest of the chapter next week. The important thing to see so far is that the book of Leviticus begins with the need for an offering to satisfy God, and to restore us to a place of peace with Him. We have already seen at the end of the book of Exodus that the Lord sanctified Israel by His presence. And yet, even with that understanding, the people of Israel were being told now that their sanctification was positional in His relation to them, but not complete in their relation to Him. This is all the more evident by the fact that there are priests who were consecrated to minister to the Lord on their behalf. And it was even more evident because the priest had to be consecrated, and they needed to also participate in their own sacrifices before they could sacrifice for the people. The more one looks into the law, into its requirements, and into what those requirements tell us, the more understanding there is that the law was and is wholly incapable of perfecting anyone. Only a perfect Person under the law could then transfer His perfection to the law-breakers. And this is what Christ Jesus has done. We could simply cut and paste this thought to the end of every sermon we go through in the book of Leviticus. The law cannot perfect, but Christ can because He was (and is) perfect. It is not that the law is imperfect, but that those who are bound by it, with but one exception, are – in fact – imperfect. And so the law, and the book of Leviticus in particular shows us this. The book begins with the notion of imperfection in man, and perfection in God. Who will bring the two together, and who will provide the needed imputation of righteousness? Thank God that the answer is found in the Lord Jesus Christ. This is why the doctrines of men – of Judaizers and of works-based Catholics and of works-based protestants – these doctrines are so poisonous. They rob people of the grace of God which is found in Jesus Christ alone. When someone tells you they don’t eat pork, tell them, “That’s great.” But when someone tells you that you shouldn’t eat pork, “Call him heretic Herman” and have nothing more to do with him. Jesus Christ embodies every single detail of this law which stands opposed to us. It never made a single person perfect. And so why on earth, God’s beautiful green earth, would you want to voluntarily place yourself back under this system designed specifically for one Man’s success and all others’ failure? Why? We’re only four verses into Leviticus and already we see what the rabid, wicked, and heretical people of the world refuse to see. We need Jesus. Thank God for Jesus who embodies this law which stood opposed to us. Thank God for Jesus who stands in its place and offers us grace. Thank God for Jesus, for us the shining smile upon God’s face. How can we hold back when so much He has done for us!